Curtis Products Group Inc. is a family owned and operated small business founded in 2002 and located in Byron Center, Michigan. 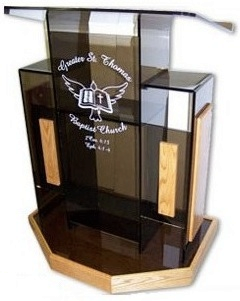 We specialize in making high quality custom acrylic podiums and church furniture. Over the past 10 years, our business has continued to grow. We personally fabricate all our acrylic pulpits, acrylic tables, acrylic drumshields, acrylic collection boxes, and other products in our family shop. We take great pride in our company, our commitment to customer service and in the products we sell. All products are quality inspected in order to provide to you the highest quality product. All products arrive with no assembly required. If you have any questions, feel free to give us a call. We are more than happy to assist you.